Mark Martin: As a homeschooling father and an Arkansas State Representative, I cannot believe the vitrolic lies and slander that gets spread in the political arena. Huckabee has never been anything but extremely supportive of homeschooling in Arkansas and has gone out of his way to protect us from a very very powerful teachers union in this state. You can believe twisted facts by bitter political rivals (including the interparty rivalries) if you wish. But the fact remains that with the exception of one legislator who was also a homeschooler, the rest of us know what Huckabee did for homeschooling in the state of Arkansas.Please don't believe bitter political rhetoric. If it were not for Huckabee, we homeschoolers would be in severe shape in this state. Spunky: Thank you for your comment Mr. Martin, You said, "Please don't believe bitter political rhetoric. If it were not for Huckabee, we homeschoolers would be in severe shape in this state." I have not believed the political rhetoric of anyone. I have done my own research and worked through the information available to arrive at my own conclusions. If you would like to read my posts and discuss the substance of what is written and clear up any misconceptions that is most welcome. However, asserting that I have believed the the "bitter rhetoric" of others is not helpful to the discussion or your own credibility. It is simply not true. The article I recently posted by Jim Holt was secondary support for my own research. I do not know Mr. Holt, nor have I obtained any of my information from him or any of Huckabee's bitter rivals in Arkansas. If you would like to believe that a Governor who increases regulation, imposes a waiting period, and who pays for testing instead of ending it is "supportive" of homeschooling, who am I to argue? But I do not consider it a postive event. Huckabee could have at least NOT signed the legislation signallng that he at least understood that this is a violation of a parents rights and such restrictions go beyond the jurisdiction of the state. After all, it was Governor Huckabee who opposed school vouchers because of the "control" it would give the state over private faith based schools. But for some reason, when the state funding is given to homeschoolers for tests, there is no protest that this gives the state "control?" What could be more private or faith based than a Christian homeschool? Sorry, that just doesn't make sense to me. Instead of fighting to eliminate testing and by offering to pay for it, Huckabee, by his own admission, imposed further state control. And for this Arkansas homeschoolers applaud him? Governor Huckabee was bold enough not to sign legislation that referred to "acts of God" and yet we see no such boldness and at least going on record objecting to this legislation. If homeschoolers in Arkansas see that as a positive, again who am I to argue? But that doesn't mean I have to accept it in my presidential candidate or call him a "friend to homeschoolers." Our nation is built on the free exchange of ideas, it's a remarkable and humbling experience when a homeschool mom in Michigan gains the attention of a legislator in another state. Thanks for checking in and offering your thoughts. I welcome your thoughts on my articles but assertions that I chose to believe the "rhetoric" of others without some evidence to support your claim will likely be ignored in the future. Nothing personal, I just don't have the time or inclination to defend baseless assertions. Thanks! Mark Martin: Spunky, Anybody can twist a situation to appear other than what it actually is by ripping it out of context.Take for example a very dear friend of mine, Jim Bob Duggar, who is no longer in the state legislature. At the time there was going to be a fuel tax, there were two proposals the first for 7% and a compromise alternative for 3% was proposed. One of them was going to pass. Mr Duggar is opposed to anytax increase, but if he failed to vote for the 3%, then the 7% would be passed. What should he do? He could count, he knew that if the 3% passed, that would strip off enough votes to cause the 7% to fail. But he also knew that if the 3% failed, the 7% would pass with a veto proof majority. What did he do? He voted for the 3%. What would you do? Don't be so sure unless you have been there. Regardless, Mr. Duggar didn't support a tax and infact adamently opposed them. To accuse him of "voting for a tax" is a half truth, which we know is not the truth at all. But you see how things become twisted? The same situation goes for Mr. Huckabee and all the half truths the uninformed and haters drag out against him. Very often Mr. Huckabee was faced with 75%+ of the legislature being Democrats. The could override his veto at will, and almost always did with few exception. And when they failed to override one of his vetos, the made him pay dearly by either passing an even more aggressive version of the bill after making back room deals to fund pork projects for the few Democrat dissenters, or worse. They would viciously kill pro-life legislation the Governor was pushing as "payback" for the veto. Politics is not as cut and dried as we would like it to be. Hard decisions have to be made.I suppose that you could counter that a politician should vote against the tax, even though it means an even higher tax would be the result. I suppose that you could say that a governor should veto a bill knowing that it will be overridden and result in a partisan backlash that kills pro-life legislation and perhaps costs countless babies lives for NOTHING. You could advocate those things. But I won't. A person can make value judgments about people and situations that they only have the slightest of detail. And they make judgements that are counter to the majority of those on the battlelines like Jerry Cox. You can do that. But I won't. I've been there. I KNOW where Mike Huckabee stands. He is absolutely a defender of homeschooling. I understand what you're saying regarding Mr. Duggar, but equating compromises over the differences in a fuel tax to a compromise of the freedom of parents to pursue their own happiness and restricting their freedom doesn't cut it for me. I can handle a compromise over a gas tax, but a governor's job is to defend his state's Constitution which is there to protect the people of his state. "I've only vetoed a few pieces of legislation in 10 years, most of which were because of they were unconstitutional and I had a clear reason to withhold them." His own reason for employing the veto is interesting. Clearly there were times he was willing to risk a political backlash to stand on Constitutional principles and in the legislation referring to "acts of God" theological reasons as well. However, in this case given that the parents' rights were clearly being violated Huckabee compromised instead. It wasn't just their state constitutional rights and freedom but, according to HSLDA, their 14th Amendment rights were potentially also violated. officials of their decision to do so. Because of this restriction, parents who encounter intolerable conditions at the public school, such as imminent danger to the safety or welfare of their child, will have to wait at least 14 days before withdrawing the child to begin home schooling or else face truancy charges for unexcused absences during the 14-day waiting period. No such restriction exists for parents who decide to immediately remove their children to attend a private or parochial school in Arkansas. This raises serious issues regarding the right of parents to direct the education of their children and equal protection of the law as guaranteed by the Fourteenth Amendment to the United States Constitution." like manner as if he had signed it; unless the General Assembly, by their adjournment, prevent its return; in which case it shall become a law, "
The bill would have become law in five days and Huckabee would have been on record standing up for the Constitution. So there was a third option available which he used in a 2004 tax bill, yet he didn't use it regarding the fundamental rights and freedoms of Arkansas homeschooling parents. We don't even see Huckabee acting on principle and offering even "token" opposition. That's what a "defender" of homeschooling does. What good is a governor who says he believes in a parents rights but then signs legislation violating those rights without at least some sort of stand against the state's imposition. Again, he was strongly against vouchers because of the control it gives the state, but yet when it comes to parents in homeschools he compromises? This just doens't make sense? As a candidate, Huckabee, is asking people to make a value judgment and elect him President based on a "faith that defines Him." He said his faith wouldn't let him pass vouchers, but yet it let's him pass this legislation against homeschoolers? This is especially troubling, when one considers that it was ONLY homeschoolers that had the waiting period. Parents who opted for a private school did not have this restriction placed upon them. Mr. Martin, Governor Huckabee is asking for our vote. An examination of Huckabee's record on key issues is part of determining if he is an acceptable candidate. I am sure Huckabee would like us to just take the word of Jerry Cox and ignore the solid evidence that refutes his homeschool record. But some of us are not that easily swayed. If Arkansas homeschoolers think it's acceptable to have a leader that compromises their contitutional rights and imposes restrictions upon them, that's fine by me. But when this leader then moves onto the national stage it's a whole new ball game. And here in Michigan we like our homeschool freedoms and don't want a President who compromises them just because democrats threaten to impose legislation. No thanks! That may be how Arkansas politics works, but we northerners are a bit stubborn and we like to fight for our rights and want leaders who do so as well. We don't applaud when a governor offers to pay for a test that they shouldn't even require homeschoolers to take. We don't applaud when a governor requires parents to take the test or face truancy charges. We don't applaud when the state requires parents to wait to take THEIR children out of state schools. We don't applaud and we don't work to elect them to higher office. Huckabee's record speaks louder than Jerry Cox and the others. The only spin is coming from Huckabee's homeschool video that promotes his record as positive and ignores facts that tell us the whole truth, not just about his homeschool record but an education agenda that advances federal and international control in education. As your rightly pointed out a half-truth is no truth at all. The Madison Youth Project online government classes are starting this week. One class is included in the price of a membership ($25). Get the details here. The syllabus for the Elements of Freedom class dovetails very nicely with the Tapestry of Grace Government course at the rhetoric level. That's the one my son will be taking. On another note, I'm taking a blogging break to decide where to go from here. I never planned on blogging past the four posts on Huckabee and Homeschooling, but as new information about HSLDA and Huckabee became available I didn't feel I could ignore it. So I went a bit longer than I originally thought. If I don't come back before February 2, you can hear me in a live (via phone) radio interview with Phyllis Shlafley at 10AM (EST). She has invited me to talk about homeschooling and education reform. I've admired Phyllis Schlafly and her work at Eagle Forum for many years, it is truly an honor to get to talk with her on her show. Here's the link. I'd like to thank to Robin Sampson at Heart of Wisdom for awarding me an Excellent Blogger Award for my recent blogging. Since I'm taking a blogging break, here are a few excellent blogs that deserve an Excellent Blogger Award and have contributed information and insight on education and/or the election that are definitely worth a read. Home Education Magazine Editors Blog and their News blog. "If you always do what you always did, you'll always be what you always were." Change is obviously a part of life. I'm trying to figure out how I apply this to blogging. A part of me thoroughly enjoys sharing information and challenging myself and others and wants to keep doing what I always did. But that doesn't mean I should keep doing it! If only God made more hours in the day, then I'd have time to be both an excellent mom and an excellent blogger! Speaking of change, that's one thing all the candidates seem to agree on, "It's time for a change." I have to say, I think You Tube videos have been the best change to Presidential politics, feel free to share your personal favorite. Is Huckabee pro-home-school, as home-schoolers claim ? The media has reported the reason Huckabee does so well, with so little money, is because home-schoolers empower him. I'm a home-schooler, and I know Huckabee actually signed Act 1117 in 1999. This law made Arkansas the first state in the nation to strengthen homeschool laws, empowering the state over the parents. After all, children DO belong to the state. Don't they ? Huckabee claims that it was a welcomed compromise. Not true. He could've vetoed it. But he caved to institutional pressure. Jim Holt is a former state senator from Springdale, Arkansas. He began his first term in the 2000. His article also talks about his disagreement with Huckabee over tuition scholarships for illegals. It's definitely worth a read. I just got on your blog tonight and was very pleased. I'm a teacher from Arkansas (an evangelical, conservative Christian) who wants desperately to warn homeschoolers (as well as everybody else) about Huckabee. However, your article "Huckabee and Homeschoolers" contained much of the info I would have shared. Another teacher friend and I originally strongly supported Huck when he first ran for Lt. Gov. She and I had already spent years educating legislators about the problems with Outcome Based Education and some of the disastrous laws they were enacting in Arkansas. Before Huck was elected, he said all the right things to the conservatives who were concerned about education. However, when he assumed the governorship, his vows to the conservatives were tossed in the trash. He's enacted every socialist, government-controlled, stifling law and regulation possible. I have friends who homeschool, and Huck, with his focus on testing, caused them a lot of stress. Believe me, Huck is not a friend of homeschoolers, and many of my friends and I have wondered why the national homeschool organization did not do more research about his positions and history in Arkansas. I read many of the comments to your article, and it's unfortunate that so many take Huck at his word. He is one of the most gifted speakers I've ever heard, and that's why so many of us first supported him. Unfortunately, he disappoints on many, many levels. I worked to help get him elected and even served on his transition team. Within six months I ( and most of my conservative friends and the teachers with whom I worked) was devastated at what I saw of his policies and appointments. Probably the most outrageous action he attempted as governor was that he actually tried to pass a regulation/law that would allow him to appoint all the school superintendents in the state. He tried to consolidate schools up to approximately 1600 students, even small schools that had excellent standardized test scores, and this action caused many students to have to ride buses as much as four hours a day. I know much of this does not specifically concern homeschoolers, but I believe that his actions in other areas of education should warn homeschoolers that he could be very dangerous if elected. Parent and local control were both undermined by Governor Huckabee in favor of state oversight and control. Are we going to let him do the same thing at the federal level? If my posts on Huckabee seem like "over kill" it's simply because I've been consistently getting emails telling me that I don't understand Arkansas politics and that I've misrepresented Huckabee. Apparently, the one who is misrepresenting his record is Mike Huckabee. Here's a complete index of posts on Homeschooling and Huckabee. From HSLDA-PAC director Ned Ryun's statement on homeschoolers and the election. 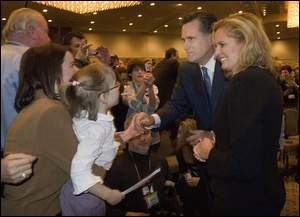 From the front page of our local paper, my daughter Elaina and I shake hands with Mitt Romney and his lovely wife, Ann. It was fun to meet Romney, but he didn't convince me to vote for him. He did manage to win the votes of 3,832 of my neighbors. I was one of the 319 who voted for Thompson, but I'm still considering Paul for the general election. For more about the event you can read my post here. I'm getting a few emails from readers who are having trouble finding all my articles on Huckabee, they are linked below. A few others have wondered if I contacted HSLDA before I wrote these. Yes, I did. It was a very pleasant conversation with a gentleman who enjoys a good political discussion as much as I do. Interestingly, he praised Huckabee's position on the UN, but had little knowledge of the IBO and Huckabee's legislation that allowed the UN backed program into Arkansas schools. (See Part 4) I have not talked to them since publishing my articles. If you're interested in the HSLDA aspect, the posts about Ned Ryun's may be of particular interest to you. I'm not surprised that Michigan went for Mitt Romney, but I was surprised that evangelical Chrsitians went for Mitt Romney by such a wide margin. victory — Romney did best. Thirty-four percent of them backed him, five percentage points better than Huckabee. That can't be good news for Team Huckabee especially on the west side of the state which is more conservative and where he vigorously campaigned. "A large section of the GOP has made it quite clear that they will do whatever it takes to ensure that the hillbilly preacher doesn't win the nomination. Many of them--and we all know who they are--will lie about his record and his positions in order to put an end to his campaign." It can't be good for Huckabee when members of his team are making him out to be the victim of his own party! If nothing else it makes him appear weak and not very presidential. But the fact of the matter is, Huckabee is the one who is prone to lying about about his own record. He lied to Fox News about the reason he begged for new taxes in Arkansas . Huckabee also lied about having a theology degree, and he lied about "always" being in support of a life amendment to the Consitutiton. Oh, and then there's the non-partisan group, Judicial Watch calling him one of the Ten Most Corrupt Politicians of 2007 along with Hillary and Rudy! And Joe Carter is worried about his political enemies lying about his record? "[Some of my opponents] do not want to change the Constitution, but I believe it's a lot easier to change the constitution than it would be to change the word of the living God, and that's what we need to do is to amend the Constitution so it's in God's standards rather than try to change God's standards,"
"Christ didn’t tell us to go to the government and pass a bill to get some of these social problems dealt with. He told us to do it, The government has its role, but we need to keep firmly in mind the role of the government, and the role of us as individuals and as Christians on the other." Does anyone else think it's time for Huckabee to do a "Baptist" speech like Romney did? I haven't had much time to put all my thoughts together, but here's a quick write-up about the Defending the Dream Summit on Saturday. I hope to have pictures posted soon. We had front row seats which gave us a great view of all the candidates that attended. John McCain: Watch this You Tube and you'll learn all you need to know about how most people at this rally felt about him. I sat next to a jovial older fellow who booed so loud he attracted McCain's attention, giving me a real up-close view of McCain. Thankfully, the fellow was 6 feet 5 and about 300 lbs. and I looked incredibly insignifcant at that point. The two of them engaged in a lively dialog during the Q&A that ended in McCain's people getting his number so that they could talk while he went to his next campaign stop. Overall, my girls said McCain came across as stiff and disconnected. I agree. McCain must have thought so too, he didn't even come to the rope to shake hands. In Detroit, that's probably a safe thing to do. Duncan Hunter: Hunter also gave a great speech. But the it was cut short because McCain went so long. Although I liked much of what he said, the fact that the press (and most in the crowd) didn't stay around to hear it, tells me this isn't his year. By the far the crowd favorite was a guy who isn't even on the ballot, ABC's John Stossel. He was engaging, funny, and spot on when it came to the role of government. I don't know where he stands on many of the issues, but if he ever decides to leave TV, he just might have a future in politics. The big guy next to me who booed McCain was absolutely gushing when Stossel spoke. The Ron Paul people were there, but Ron Paul wasn't. Overall I didn't think they handled themselves or represented Ron Paul very well. I talked to a few of them and asked some questions, but they seemed to view anyone who would consider voting for anyone other than Paul as a traitor to the Constitution. I don't think that's what Ron Paul believes, but he does seem to attract a rather different sort of supporter at these rallies. That's too bad. Paul has great things to say and needs to be able to attract people who can effectively communicate his message. Huckabee had a campaign bus there that looked like it was from the 1980's, but it worked and got his supporters to where they needed to be. Good stewardship even if he's not my candidate. The media pass wasn't a great as I thought it would be, I was told it would get me into the "green room", but it didn't. I was only able to get into the media room which had a bunch of reporters around a few monitors or in front of their laptops. But it did save me the $60 cost of admission and a decent lunch, so I'm not complaining. I did attend one break-out session on "Values Voters" that was informative especially when the head of the Michigan GOP Chairman talked about coming together even thought we disagree. I was unexpectedly able to address the group of about 150 or so people on the education issue. Yes, I talked about Huckabee's education record leading to quite a few cheers in the audience and a few nasty emails afterwards. So who did I vote for in Michigan's primary? Fred Thompson. Not that I don't like Ron Paul but I had to choose somebody. They had an equal number of pluses and minuses. But Thompson won because that's who my husband was voting for. That old submission thing saves the day and keeps me from having to make up my own mind! Actually, we reasoned that Ron Paul has enough cash to be in this for the long haul and hopefully a decent showing in Michigan for Thompson might give him a little boost going into South Carolina. Does this mean I'm going to start stumping for Thompson? Not necessarily. I had to make a choice today based on the facts I have up until now. But my support is far from solid and if Ron Paul decides to go third party, he still might get my vote in the general election unless the nominee is Fred Thompson. Then I'm back to undecided. As Important as the Education Issue is on the ballot, LIFE, is STILL by far, the most important one, and will remain the most important one. These homeschoolers are doing what everybody else in the country is doing, nitpicking. There is NO perfect candidate. Do we vote for the candidate who fully supports the homeschooler and rejects the one world education through the UN, and who is also not totally protective of LIFE; or do we vote for the one who doesn't support the homeschooler, allows the one world education, yet He vows to protect Life from conception to natural death. I'm NOT confused. I KNOW who to vote for. YOU SHOULD TO. And this was one of the nicer emails! I'm not a one issue voter, but this is a one issue blog. Just because I blog about education and homeschooling doesn't mean I don't take other issues into account or less seriously. I'm just not as knowledgable on those issues and so rather than make a complete fool of myself by offering an opinion on something I know little to nothing about I stick to topics I know best. National Right to Life has put together a comparison chart of all the candidates and where they stand on the life issue. Based on this list, and the candidates websites, there appear to be several candidates whose stand for the life of the unborn is strong, not just one. Hunter, Thompson, Paul, and Huckabee all strongly support protecting the life of the unborn child, Romney appears to be pro-life but he has come to that conclusion more recently and that's why he is lower on my list. So while I can appreciate that this reader and others have made up their mind based on this issue alone, I see several candidates whose position on the sanctity of life is one I could support. And for those who think that Huckabee has distinguished himself from the others by his support of a human life amendment, I addressed that issue specifically in an earlier post, How does Huckabee Define Always? Until recently, Huckabee believed the sanctity of life was a state's rights issue very similar to the position of Thompson and Paul. Read the post if you would like more details. The Washington Times had an interesting editorial about how US history is no longer being taught in our nation's schools. This wasn't news to me and this editorial reminded me once again why the next election is so important. International standards are invading our schools, global citizenship is replacing national citizenship and common morality is replacing absolute Truth. Our next president will either stop this trend in education or continue our march toward globalization. Huckabee has already demonstrated where he'd take us - global not local. That's not the way for me. Speaking of Huckabee, I listened to a live interview this morning on a local radio and if his homeschool compromise and the IBO, had not already decided it for me, his insistance that the 30% Fair Tax is only a 23% tax grated on my mathematical ears. I also want to know if my children get a prebate too? They all purchase many of their own items from their own income (not allowance) and a national sales tax adds significant costs to their purchases. My son purchased a violin last year that was over $1000 dollars with the fair tax that would have added another $300 to his costs! Don't tell me this tax is fair to him if he doesn't get a prebate too! "I dream of the day when we are doing such an efficient and effective job of taking care of our families and our neighbors that the government can do what it does best -- and that's protect us, not have to provide for us,"
For a man of faith who believes God can turn "5 loaves and 2 fish" into a winning campaign, he certainly demonstrates little faith in the good Lord's ability to feed our nation without government assistance! Ironically, how does Governor Huckabee want to show his thanks to homeschoolers who are some of the most efficient and effective at taking care of their families? By offering "assistance" to homeschoolers! Does Huckabee really want us taking care of our own or not? So Huck's out, but who's in? That's the question many are asking in Michigan today. I've never met so many people, so undecided, so close to a primary. Phooey on all of them...I like Thompson even better now. There's homeschoolers for every candidate out there. I've heard from Huckabee, Romney, and Paul fans quite a bit. But Dana's comment has me wondering if there are Thompson fans who are just waiting to see if he sticks out until their state's primary? Similar to Dana, the pundit class is buzzing about his strong debate performance in South Carolina and makes them wonder if he's not the sleeper in this race. But what I do know, is that I have to decide by Tuesday! Any thoughts you can share to put me in someone's camp by Tuesday will be strongly considered and appreciated. As a side note, a Michigan pollster Steve Mitchell, just said on the radio news that the current polls are showing McCain with a strong lead over Romney, with Huckabee, Guiliani, and Paul fighting for third place. More details will be out later today. UPDATE: My first blogging buddy, Anne in Hawaii, has decided and put her ballot in the mail. Last night's debate seemed to seal the deal for her. My posts on Huckabee and why he's not my candidate are here. But one thing that is certain is that the Michigan primary is next week, which means they've all turned their attention to my home state. And for me, and others, that means we're going to get an up-close look at the candidates and a chance to make our voice heard in the political process. For me it could be REAL close. To help conservative Republicans decide the Americans For Prosperity has put together a one-day Michigan summit with the Republican candidates. The good news is they're encouraging families to come. They have made it very affordable and included lunch in the admission price. We’re bringing together some of the nation and state’s leading free-market voices just three short days before the Michigan primary – some of the confirmed speakers include presidential candidates U.S. Senator John McCain and Governor Mitt Romney, ABC 20/20's John Stossel, The Wall Street Journal’s Steve Moore, the Mackinac Center’s Michael LaFaive, State Representative Jack Hoogendyk, and the Michigan Chamber of Commerce's Richard Studley. All the Republican candidates have been invited. Duncan Hunter will also be there. Ron Paul will be speaking via satellite. Fred Thompson and Mike Huckabee are still uncertain. This is a family event. So if you're in the Detroit area, this is your chance to hear the candidates and let your voice be heard as well. The cost is $29 for general admission, students are $15, family admission is $59. Details here. There's also a possibility that I might be a panelist on two of the break-out sessions, Value Voters and Grass Roots Activism. If you live near the metro Detroit area or can get here, Saturday should be a very interesting day. And if you can't make it to Michigan but are looking for a way to get your children educated in the political process and conservative ideas, check out the Madison Youth Project. Their online academy is starting this month and for the cost of a membership ($25) you can sign up for one online class. They are currently offering, “The Elements of Freedom,” and “Founding Fathers and Founding Documents.” You can get all the details here. My site is getting hit with Google inquiries on Huckabee and homeschoolers most likely because Rush Limbaugh said today that HSLDA did not endorse Huckabee but that Farris did. Ned Ryun has the transcipt. In another thing, we had a guy, Eric from North Carolina, who called and said and that the Home School Legal Defense Association endorsed Huckabee. That’s not true. One of their top dogs did, a guy named Michael Farris, but the association did not. You can go through their website and you will find a lot of critical articles on Huckabee, re: home schooling. They had a press release saying that Farris’ endorsement is not an endorsement from them. That's only partly correct, but his confusion is somewhat understandable. Rush, like many others, is confused about Farris, HSDLA, HSLDA-PAC and why Farris made this endorsement. HSDLA-PAC did endorse Huckabee, here's the link. HSLDA-PAC is the connected PAC of HSLDA. HSLDA cannot endorse candidates outside its membership. According the HSLDA-PAC website, the PAC was formed to "allow HSLDA to engage directly in the political arena." But as I previously posted, Ned Ryun the former director of the PAC alleges that this endorsement was done unilaterally and for all intents and purposes was a Farris endorsement. He was not told of the endorsement until after the fact. So Rush was incorrect, HSLDA-PAC did endorse Huckabee. But if Ned Ryun is to be believed this endorsement was in reality a Farris endorsement acting alone but done through the PAC. So Rush may have been wrong and right at the same time. Wrong in that the HSDLA-PAC did endorse Huckabee, but right that it was really Farris who actually made the endorsement. The HSLDA-PAC endorsement was done despite Huckabee's Arkanasas record which added restrictions to homeschoolers along with allowing UN involvement in Arkansas schools. Huckabee also encourages increasing federal involvement in education. I sure wish Farris would clear this up and be upfront on why he endorsed a candidate who supports the very things HSLDA opposes. "People involved in a structure spend more time and energy maintaining that structure than in working toward its goals." Is this what's happening to Farris and HSLDA? It has been reported that Farris is a senior unpaid advisor to Huckabee and has been since the early days of his campaign. The fact that this has caught Rush's attention means that this story is far from over. Stay tuned. I emailed Ned Ryun about the Rush show today and he offered a few more thoughts on the HSLDA endorsement. "As PAC Director at the time, and having been PAC Director from the very beginning of HSLDA-PAC, we had standards by which we operated. One was that we did not endorse in fields in which there was not a clear cut conservative vs. moderate/liberal; I find it highly ironic that we endorsed in such a crowded field, and endorsed someone who I knew, even then, was a big government Republican. " You can read complete statement here. Ryun has sinced moved on from HSLDA-PAC and has started the Madison Youth Project to "promote conservative ideals, to raise up a generation prepared and positioned to lead tomorrow, and to elect candidates today who share this vision. 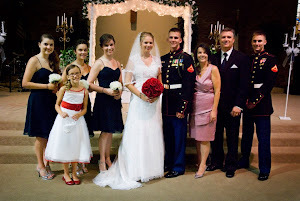 We are pro-family, pro-life and pro-growth." Online classes are now forming. "Spunky has not read any of Huckabee's positions or consulted his record.... Personally, I think the real story about Spunky is that she is probably a Ron Paul supporter who has put her tin foil hat in the closet long enough to pose as a Romney apologist." "You've made it clear that you do not like Huckabee- too clear for some of us. Can you please tell us a better answer then? Say you've convinced some of the readers here to NOT vote for Huckabee- okay- than who SHOULD they vote for? Hillary? Maybe Gulliani? " OK, this is getting absurd. Are you just an anti-Huckabee site now? I assume you have a candidate you support (I'm betting I know who it is), so why aren't you writing tons of pro-pieces for your guy? This just seems really base and negative to keep going off about one guy. That's just a small sampling of the email and comments I've received since I wrote my series on Huckabee and Homeschooling, so it's time to address a few things. I'll start by clearing up Quiverdaddy's most important point first. It's time to be perfectly honest, I only use tin foil for baking and in a pinch to wrap a small gift, but I never wear hats (I have a small head) and certainly not one made out of tin foil! And as far as not having read Huckabee's positions or record, I only have to wonder if Quiverdaddy, actually read my posts? As for the anonymous comment, I do not dislike Mike Huckabee. I strongly disagree with his policies especially in education and his compromise on homeschool legislation. That's all. I'll come back to the second part of the comment in a bit. I've heard from quite a few people like Jess, who thought that my series was too negative. Fair enough. So let me be try to be a bit more positive. I'm positive Huckabee is bad news for homeschoolers. Seriously, the information I've presented is positive. The truth is always positive but not always pleasant. If this series seems negative it's because Huckabee's record IS negative. I actually started out this research looking for a reason to like Huckbee based on a conversation with a few friends. I went to HSDLA's website looking at their reasons for supporting him, thinking that they would offer the most compelling case given their endorsement, but I didn't just accept what they said as the truth. That's tempting, but it's too easy. So I checked out HSDLA's archives to learn about the history of homeschooling in Arkansas. I read Arkansas Department of Education websites, comments from the National Governors Association, and the Education Commission of the States. I read news articles and pro-Huckabee sites. I tried to like him, but the truth pointed in a vastly different direction than the conclusion drawn by HSDLA-PAC. I talked to an HSLDA representative for nearly an hour. After all the research, I then published my findings to challenge myself and my facts. I believed I was right in my asessment, but until I'm willing to submit my findings to the scrutiny of others, I would never really know if I was right. Blogging my thoughts here and in comments elsewhere provided the perfect vehicle to find out, especially since I'd received a fair number of inquiries about Huckabee and homeschooling. No one provided an substantive rebuttal to what I wrote. Then in a pleasant twist of events I learned that Ned Ryun, the former director of HSDLA-PAC, agreed with my assessment and provided some insight into what was going on at HSDLA. But let me clear up another rumor, no one wrote these posts or gave me the information. Rombots have not taken over SpunkyHomeschool. The work was time consuming, trust me. But the research is necessary to make an informed choice so I did it. Not just for me but for my kids. Huckabee's a likeable guy, but education reform is trending toward universal standards, global citizenship, and common morality at the expense of national citizenship and absolute Truth. That's not a trend I want to continue into the next decade. Likable isn't enough anymore. We need someone who doesn't believe politics or education is "vertical." That's the rhetoric of a compromiser. Huckabee has the unique quality (well, Clinton had it too) of making you think he's got deep rooted convictions only to find out he's manipulated you without even realizing it. That's how he got the NEA and the HSLDA-PAC endorsment. If a man will compromise to get elected, he'll compromise when he gets into office . Huckabee compromised in Arkansas, he'll do it again if he's elected President. "Vertical" politics just doesn't work for me. So that leads to the obvious question, "Who should we vote for?" If I've cast doubt upon Huckabee I hope it's because my information is factual and readers have checked out what I've said just like I checked out HSDLA. The stuff I've written about Huckabee can be done on any of the candidates, by anyone. I'm nothing special, just a homeschool mom like you with a keen interest in learning. Take what I've written and build on it. Call the campaigns, read their websites, google their name and the key phrases in education. Read their statements and what they've said over the years. I know it's grueling and time consuming, but the alternative is to be similar to the woman in my original post who just said, "He's a Baptist minister, so I don't have to ask what he stands for." And then vote based on assumption of agreement and nothing else only to find out after the vote that that he's not quite "one of us" after all. So, use the primary season to do the research and don't rely on me or anyone else to tell you who to vote for or not to vote for. There's something strangely satisfying about knowing who you're going to vote for. No one likes indecision. But indecision is better than a wrong decision. Let your indecision during this primary season drive you to educate yourself and you won't need me to tell you who to support. You'll be wise enough to know all on your own. If more people took that approach the better off this country will be. That's what a primary season is for. Make the candidates work for your vote, don't just give it away because they talk like "one of us" or someone you know endorses them. Their motivation may not be in your best interest. That's not a cop-out because I don't want to tell you who I might support. It's actually the same thing I often tell my kids when they don't know something. Don't rely on me, I'm not always going to be here (and I might be wrong!). Get out a book and get online and begin to learn about the issues. Read. Ask questions. Then go back and read some more. Don't accept something just because someone says it's true. Make sure it is true. The good news is that for everyone but those who live in Iowa, you still have some time left before you have to make a decision. And by the way, if you do take that approach and find out I've missed it somewhere in my facts please let me know. I welcome the opportunity to fix any errors and learn more myself.